Phoenix is well out of the way for a pilot based in Louisville, Ky., and living in the Chicago area. It takes a bit of intentional finagling to get into Phoenix with enough time to visit an elevator. Fortunately, the Mayer-Osborn grain elevator in Tempe sits at the foot of a hill, just a few miles off the end of an active runway at Phoenix Sky Harbor International Airport. A steady stream of airplanes flies directly over the elevator, either coming from, or going into the airport, depending on the wind conditions. After seeing it many times from the air, I arranged for a four hour layover in Phoenix, which was just enough of an opportunity to grab a rental car and go see it. 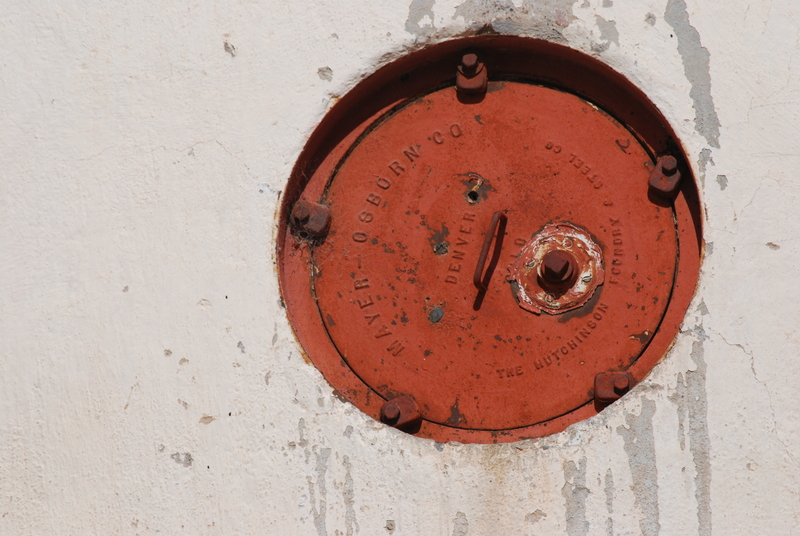 Manhole covers are embossed with the company name. Each annex bin has a manhole cover. 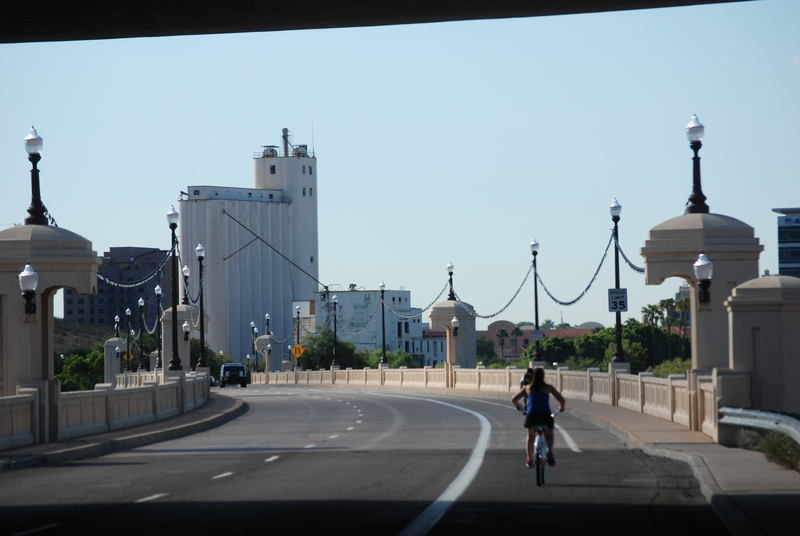 The straight-up styled elevator with its annex was built in 1951 for the Hayden Flour Mill, a Tempe landmark which had already been in operation for decades. It once proudly displayed the “Hayden Flour Mill” name, painted along the annex side, in lettering that has been painted over at least twice. The white paint has now faded enough for both lettering jobs to show through. My dad, Jerry Osborn, remembers when his father worked the Mayer-Osborn job in Arizona. Dad would have been about seven years old. The job was one of many that took Bill Osborn away from his home in Fremont, Neb. The Mayer-Osborn elevator and annex nestle at the base of a hill, gracing the neighborhood like a white gemstone in a gleaming setting. 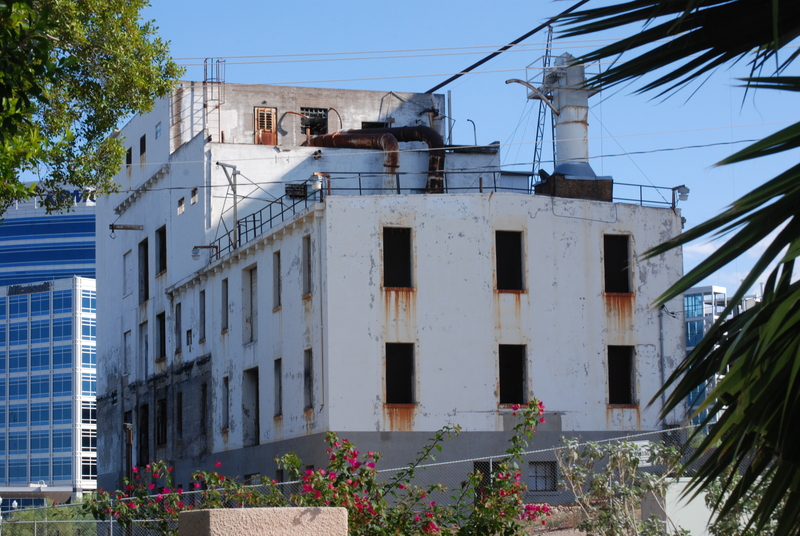 The Hayden Flour Mill, which has a strong historical significance to the area, is a rather unremarkable looking building, located at the base of the elevator. The neighborhood has grown up around it with shining highrises, shops and hiking trails, erasing the former industrial setting, and replacing it with an upscale ambiance. 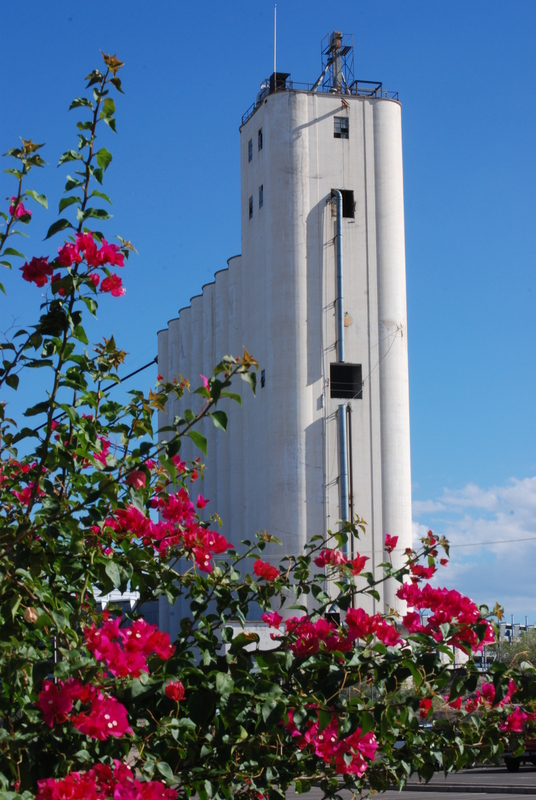 It is fortunate that the mill and elevator add character and personality to the place, and that city planners have recognized their value. Now a park and lawn surround the mill. The mill’s windows have been screened so that tourists can look inside, and historical plaques detail its history. The elaborate plans for the mill have been put off after the market crash in 2008, but fortunately the goal of preservation has not been abandoned. It is good to see one of my grandfather’s elevators safely ensconced in a community that values its presence. This entry was posted in Mayer-Osborn, Photography, William Osborn and tagged city planning, construction, grain elevator, Jerry Osborn, Mayer Osborn, Phoenix Sky Harbor International Airport, preservation, slip-formed concrete, Tempe Arizona. How wonderful to know that they value the history and beauty of it! Jewel is the perfect word. I have a picture of my dad, Cecil Garrison, in front of the Tempe job, upon completion, I believe he is with one of the Hayden’s. I would love to see the picture, and to share it, with your consent. The Tempe elevator sits just east of the Phoenix airport, and I have picked it out many times at the foot of the hillside as we approached touchdown on the western runway–it is a white and shining monument, visible from far off. It stands as a true memorial to its makers. I will revisit it then, and include an airborne shot I took “on the fly” with my phone last time I went over (as a passenger, this time). If you can tell me a little bit about your dad, I would be honored to share your story!